“In Dublin’s fair city, where the girls are so pretty, I first set my eyes on sweet Molly Malone…” Sorry, just catching up on some family business. It’s true though; I saw the statue of my semi-fictional possible ancestor on Grafton Street about ten years ago (I couldn’t see any resemblance myself, but you never know). Aside from the famous fishmonger/woman of the night, of course, the Irish capital’s most well-known artistic creations are those of James Joyce, whose epic (in all senses of the word) novel ‘Ulysses’, did so much for Dublin’s culture – not to mention the tourism industry. However, Joyce’s preoccupation with his home city started much earlier, with the writing of a group of short stories which were to become the collection entitled (simply, and somewhat unimaginatively) ‘Dubliners’. This collection consists of fifteen short stories, most of which are very short indeed (in fact, if you take out ‘The Dead’, a late addition to the book, they average about nine pages each). Each of the stories takes place in Dublin, usually over a very limited time span, and follows a local resident along their merry (or not so merry) way before ending, if not suddenly, at least unexpectedly. By this I mean that there is no real conclusion to many of the tales; the story simply stops, and we move on to the next little view of the great city. The writing is beautiful, seemingly effortless, and despite the brevity of most of the stories, the reader is sucked into the details of the main protagonist’s life – what little we see of it anyway. Joyce also manages to tell the tale through language tailored to suit the speech and thoughts of the character he has created, which may sound obvious but is not actually that easy to do. As the book progresses, the age of the main character increases; where the first few tales are centred around children, by the end of the collection, the central personalities are far more mature (in years, if not always in behaviour). The last of the stories, ‘The Dead’, which, at 34 pages, is by far the longest in the collection, could easily serve as an example for the rest of the tales. A seemingly simple account of a Christmas party at a dance academy, followed by the main character’s trip back to his hotel with his wife, manages to cram in several of Joyce’s most common themes: the status of Ireland as an occupied country in search of its past in the face of an uncertain present; the presence of sexual desires, despite the teachings of the church; above all, the importance of the everyday, the common, the mundane. The final passages, with Gabriel in his bed imagining the snow falling all over Ireland, “upon all the dead and the living”, are simply beautiful. Having read ‘Ulysses’ earlier this year, one of the questions I had about this book was whether, forgetting what was to come in the future, this set of short stories would actually measure up. It would be (and is) very easy to see in it the germs of the great novels to come, but is ‘Dubliners’ any good in its own right? I can assure you that the answer is an emphatic yes: it is a perfect example of the art of telling short stories. In fact, while ‘Ulysses’ is an undoubted classic, it would have been very interesting to see what kind of novels Joyce would have produced had he decided to become merely a successful novellist and not a genre-destroying genius. Something to ponder as I look out of my window and see the raindrops slowly sliding down the glass. Yay, I love Dubliners as well, especially "The Dead". I don't have the hutzpah, however, to even try Ulysses. Hi Tony. I studied Dubliners for A-level many moons ago, and would heartily concur. 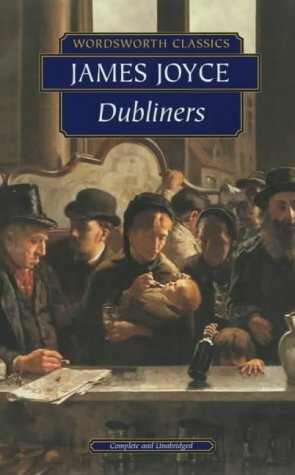 Dubliners is a wonderful book in its own right, although I think I didn't appreciate it as much when I was 17 as I do now. I also read it when I was a teenager (possibly), but I remembered absolutely nothing about it – save that it was set in Dublin! I'm not a big fan of short stories (although not for the ridiculous reason I read on one post comment where someone thought that people didn't have the time or willpower to commit to reading 10-15 pages in one go…), but I really enjoyed this collection. I agree. _Ulysses_ was an *experience*, but in many ways I enjoyed _Dubliners_ more (especially "The Dead").I recently bought a cheap copy of _Finnegan's Wake_, but I'm waiting a bit before I try another long Joyce novel. You've convinced me to pull Dubliners off the shelf! I think I'll do a story from it for Short Story Monday this week. Nice post, and the Ulysses one as well. This just reminded me that I was supposed to be reading Finnegan's Wake this year but I conveniently 'forgot' it when doing up my list yesterday. BTW, the statue of MM bears no resemblance to anyones idea of what she might have looked like if she existed so you can hang on to your possible relationship.